Since at the outbreak of WWII, horses were still the predominant way of getting around for German forces, apart from actually marching that is, mounted figures by a main injection moulded company are still quite thin on the ground. Dragon have bridged the gap before with a set of 8th Cavalry Division figures and also German Cossacks. Being so thin on the ground, this set is especially welcome, but the fact that it's also Generation 2, only makes it better! The set consists of two mounted figures, which arrive on 5 light grey sprues and 2 photo etched frets, one large, one small. The figures represent two soldiers of the 1st Cavalry Division as they would have appeared in Russia during 1941. The box art has one of the soldiers wearing a Lance Corporal's sleeve patch, but there doesn't seem to be an option for this in the kit? The figures themselves aren't posed doing anything spectacular, that is they're both sitting straight, looking straight ahead, no expressions. I suppose Dragon have decided to play it safe here, and I don't blame them. With these poses they're likely to attract the most number of people to actually buy them, fitting as they do almost any scenario. Both figures are wearing M4 Field tunics, and could be wearing the leather-lined breeches, although this is difficult to tell from the illustration, although you couldn't tell from the actual unpainted parts either. Both figures are also wearing riding boots and helmets. The horses are particularly well done. Both are posed striding with diagonal legs raised from the ground, opposite to each other. Being Generation 2 figures of course they come with a choice of heads! You can either use a head with mouth closed around the bit, or mouth open................. which I suspect most will choose in order to display those wonderful teeth which will be fun painting! Each horse comes in two halves, no great surprises there, with, as said before, separate heads, separate section holding both ears, and of course a separate mane and tail, which are extremely well sculpted. 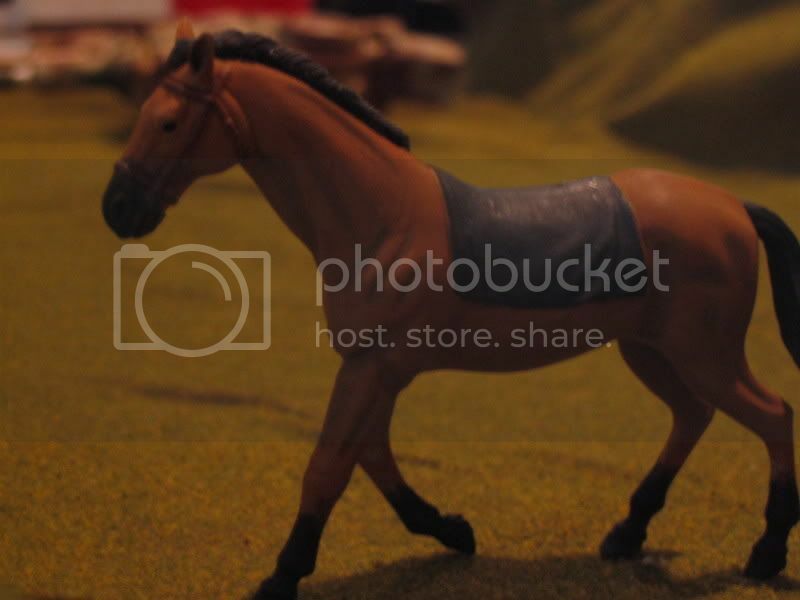 The horses, it has to be said, are extremely well sculpted, the proportions look spot on, there is vein detail in all the right places, and the musculature looks correct. Although the bridle itself is moulded into the horses heads, along with a simple blanket, the rest of the tackle straps are supplied as photo etched parts, which includes stirrups, reins, girth strap etc. The horses hooves are also supplied separately, albeit with their locating holes moulded in back to front, so just cut off the pins at the bottom of each leg. Although each hoof comes with a detailed shoe moulded on, we also get photo etched ones, which would look great once fitted. For the purposes of this review I left the photo etch alone, electing to use the styrene parts wherever possible. 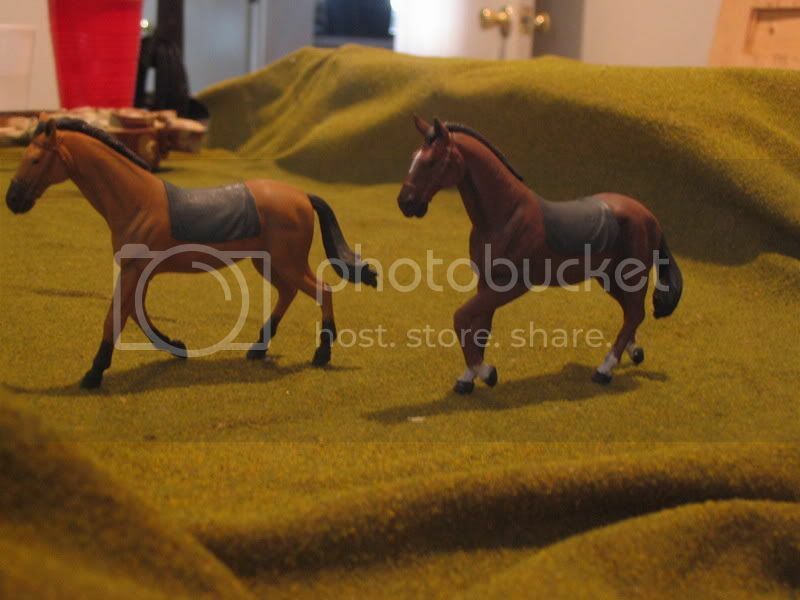 The saddles for both horses, are not moulded as one piece, but instead come as separate parts, so it should even be possible to model a horse without a rider should you wish to source another figure. As with all the generation 2 sets so far, the equipment is immaculate, consisting of bed rolls and panniers for the saddles, and all the usual equipment for the figures that was included on the generic GB and GA sprues, and WA weapons sprue. The second, very small photo etch fret is the one from the Generation 2 mine detectors set, and contains shoulder boards, belt buckles and assorted medals. Building the figures proved quite difficult. Obviously I built the horse and rider separately, and a small amount of filler will be required around the shoulder/arm joint. Apart from the previously mentioned fault of the locating pins for the hooves on the bottom of the legs being the wrong way around, the horse went together extremely well. The figure, not so well. Try as I might I could not get the figures arms to match those in the illustration. No big problem, he'll just be slightly different. However, getting him to sit on the horse realistically was difficult. He doesn't just fall into place. There is some resistance, and this could have been moulded much better. The only way I can see to construct these figures is for judicious sanding and paring with a scalpel blade, installing all the photo etch reins etc. and then painting. Not an easy job I would have thought. I have to say that this is my favourite Generation 2 set so far. Despite potential construction difficulties, work at it and the result will be something special. Really special............ injected figures just don't get better than this. Highly recommended. Photo etched reins, stirrups......... beautifully moulded horses, great detail. This set is going to look so great when finished! I agree, that is exactly what these threads are for, to discuss the object at hand. However, I do not see it as 'duking' anything out. Its simply putting forth the facts on one hand and the other hand trying to sell a kit at all costs. It's just that the two dont always mix together... Rob, From what I understand DML figures are sculpted in 1/16th scale, then panographed down to scale. I would dare to say thats what Tamiya is doing as well by looking at their identical 35th and 48th scale sets.